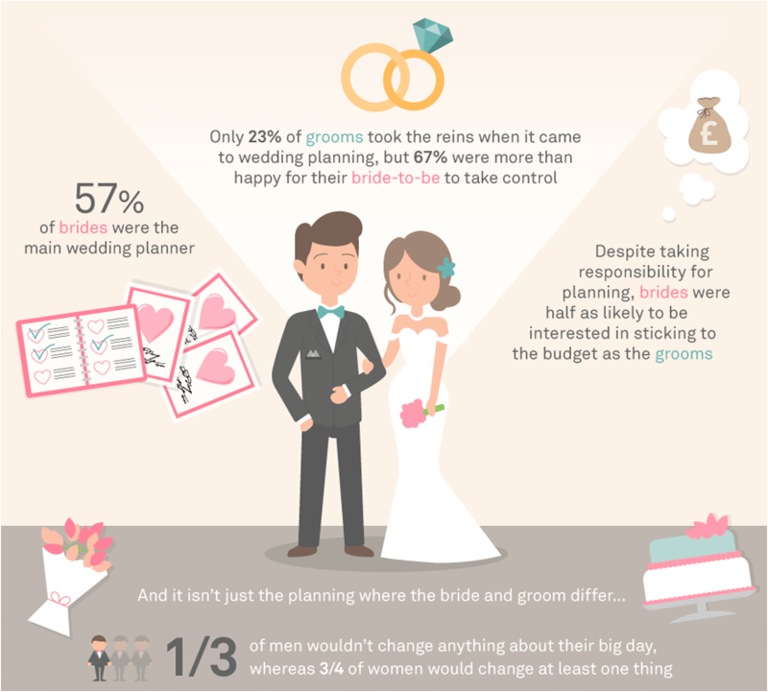 Bride vs. groom: Who spends what on the wedding day? Did you know that 50 per cent more money is spent directly on the bride than the groom? During the bittersweet period of wedding planning, many couples soon realise that budgets can be blown in a matter of minutes – a nine tier wedding cake, anyone? But did you know that 50 per cent more money is spent directly on the bride than the groom? This is just one statistic uncovered by Amigo Loans during a study of 500 newlyweds. With brides racking up, on average, £2,000 more in wedding costs than the groom, we look at who takes control of the big day, and where the money is spent. Brace yourself. To say wedding packages can be expensive is an understatement. Venues, food and drink, music: there’s certainly a lot to think about. In fact, our study showed that couples spend around £9,100 on their big day, with a quarter of first marriages costing more than £10,000. 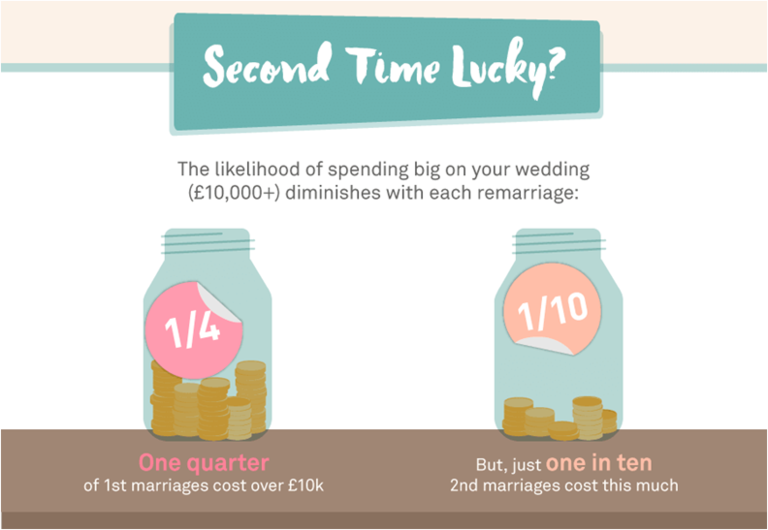 However, our data also showed that just one in ten people who marry for a second time break the £10K barrier. Similarly, people who marry for a second time are more likely to stick to their budgets and have cash left over. Only 12 per cent of second-timers go over their agreed budget, as oppose to the 19 per cent of people who marry for the first time. When it comes to the sexes, there aren’t any prizes for guessing who wears the wedding trousers. Our study showed that 57 per cent of women act as the main wedding planner, admitting to taking full control of their big day. Research found that only 23 per cent of men take the reins when it comes to wedding planning, which may explain why more is spent on the bride! But according to our study, men aren’t exactly kicking up a fuss. 67 per cent of the grooms surveyed said that they were happy for their bride to take the reins, whereas just 14 per cent of women were happy when the role was reversed. On average, women were the more frugal of the sexes, with research showing that twice as many females admit to not being overly concerned by keeping an eye on budgets. From cakes to churches, it seems that women are most conscious of the details when it comes to the perfect wedding day. Despite the majority of women taking control of wedding day plans, our survey showed that three quarters of females would do things differently if they had another chance. Only a slim proportion of newlyweds wouldn’t change anything about their big day (27 per cent), with a third of all men saying that they were happy with how their wedding day turned out. According to our 500 newlyweds, the expense of lavish weddings becomes less important with age. Statistics showed that couples over 45 years old spend the least on their wedding day, with only 17 per cent spending more than £7,501. On the other hand, younger respondents spend the most on their big day. Figures showed that 39 per cent of 25 to 34 year olds have weddings that cost in excess of £7,501, with 35 per cent of 18 to 24 year olds also splashing the cash. But spending through the roof isn’t always intentional, with a third of all couples surveyed saying that they spent more than they planned to, or didn’t have a budget.